Musician Joshua Homme of Queens of the Stone Age performs onstage during day 2 of the 2014 Coachella Valley Music & Arts Festival at the Empire Polo Club on April 19, 2014 in Indio, California. 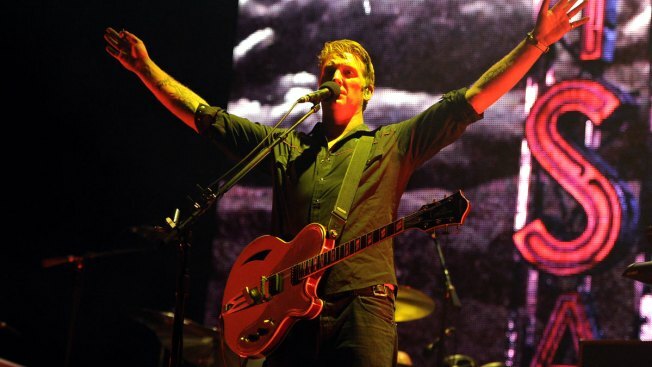 Queens of the Stone Age frontman Joshua Homme has apologized after a photographer claimed the singer kicked her camera while she photographed the band's concert in Southern California. Photographer Chelsea Lauren said on Instagram that she sought medical treatment after the camera smashed into her face from the kick Saturday night at a radio station's annual Christmas event. Video posted to social media shows Homme swinging his leg and connecting with the camera while playing guitar at the Forum near Los Angeles. Homme said on Twitter Sunday that he was "in a state of being lost in performance" and thought he was kicking lighting equipment on state. He says it was unintentional and he hopes Lauren accepts his apology. Emails seeking further comment from Homme's representatives were not immediately returned.